George is building a one-story room addition with a basement onto his house. He is looking to maximize square footage while at the same time meeting his requirements. The addition will have a full basement, and George hates support columns in the middle of his basement. Therefore, George wants to buy a single beam (girder) that will run across the length of his basement down the middle and only be supported on the ends. The beam will be used to support the floor joists. George’s basement will be 8 feet tall, but the beam height will intrude into that space. Therefore, George has decided that he doesn’t want a beam taller than 8 inches. The beam will only support the weights imposed by the single floor, and not the weight of the walls and roof. George has consulted his local building codes and found that a floor must be able to support up to 20psf dead load (furniture, bookshelves, carpet, etc) and up to a 40psf live load (people walking around). George knows that this will be his party room with people jumping around, so George plays it safe and assumes 20psf dead load and 50psf live load (70psf total load). George also consulted his building codes on floor deflection and learned that the floor must not deflect downward more than 1 unit for every 360 unit lengths spanned (a rating of L/360). George knows that this building code minimum will be safe but will result in a very bouncy floor. George hates bouncy floors and has decided to design for a deflection rating of at least L/720. George also wants the length of the room to be greater than or equal to the width of the room. George knows that the best way to meet his requirements will be to choose a steel wide flange beam. George called his local steel retailer and found that the largest, heaviest, and strongest 8 inch beam they sell is a W8x58 beam, meaning that it is about 8 inches high and weighs 58 pounds per foot length. 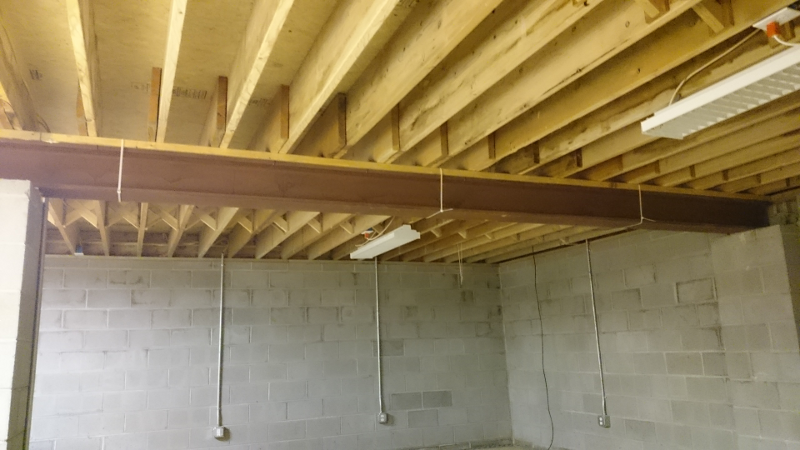 An actual W8x58 steel beam supporting the floor joists in the basement. Maximize room addition square footage. In other words, find the optimum length and width of the room addition while satisfying the constraints. For this exercise, all calculations will be done in inches and pounds. Top view sketch of room addition basement. Use a W8x58 wide flange beam made from ASTM A992 steel. Beam will only be supported at the two ends. Achieve a deflection rating of at least L/720. Make sure beam safely satisfies bending stress requirements. 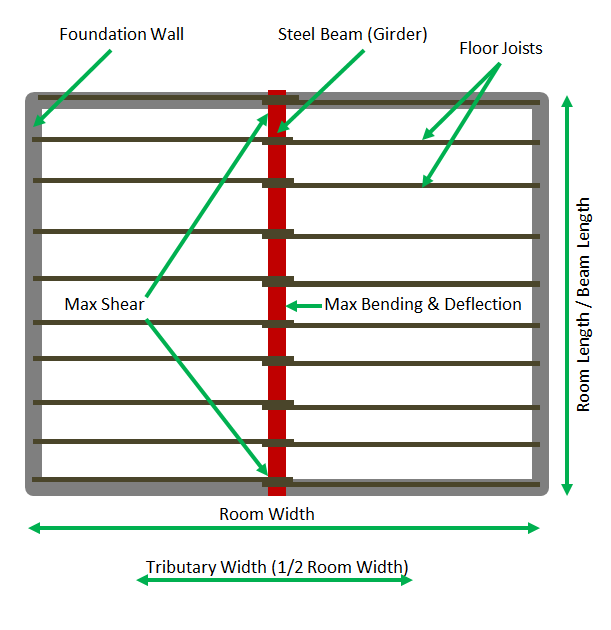 Make sure beam safely satisfies shear stress requirements. Room length is greater than room width. DEAD_LOAD_PSI = 20.0 / 144 #The dead load is 20psf or 0.1389psi. LIVE_LOAD_PSI = 50.0 / 144 #The live load is 50psf or 0.3472psi. We want to maximize room area. Room area is given by the following equation. Now we can take this equation and create a Component called NegativeArea . George wants the length of the room to be at least the width of the room, given by the following equation. If we create a variable called length_minus_width , we can constrain it to be greater than or equal to zero. Now we can take this equation and create a Component called LengthMinusWidth . Now we can take this equation and create a Component called Deflection . Now we can take this equation and create a Component called BendingStress . where A is the cross sectional area of the beam. Now we can take this equation and create a Component called ShearStress . First we must take all five of our Components and combine them into a Group . The design variables room_length and room_width must be created as IndepVarComp , and they are initialized to 100 inches as a best guess. Then, we connnect the design variables to the inputs of the five Components . Finally, we set up the problem. We bound room_length to only be between 5ft and 50ft, and room_width to be between 5ft and 30ft. We set our minimization objective to neg_room_area . Then we constrain the outputs from our Components. The solution indicates that the optimum room size is about 19ft by 19ft (using a 19ft beam), which is about 359 sq ft. The fact that the room is square makes some sense since squares are more efficient at yielding more area than rectangles. It is clear that deflection was the limiting component at the limit of L/720. The bending stress ratio was not limiting (0.149 < 0.5). The shear stress ratio was not limiting (0.008 < 0.33). OpenMDAO Partition Tree and N^2 diagram. Left clicking on a node in the partition tree will navigate to that node. Right clicking on a node in the partition tree will collapse/uncollapse it. A click on any element in the N^2 diagram will allow those arrows to persist. © Copyright 2015, openmdao.org. Last updated on Nov 16, 2016. Created using Sphinx 1.3.1.